On Sunday February 3, 2012, it was official – the Baltimore Ravens defeated The San Francisco 49ers 34-31 in Super Bowl XLVII in New Orleans. 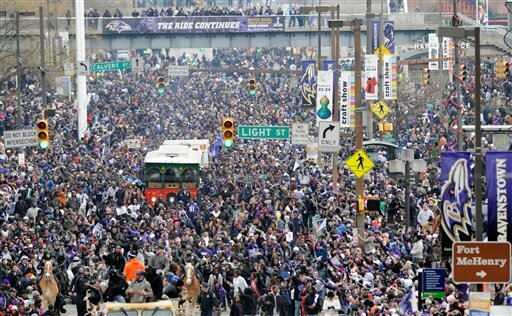 Just three days later on February 6, 2012, The Baltimore Ravens greeted an estimated 200,000 fans, who braved the frigid temperatures, and lined the streets and the stadium, in a celebratory parade through Baltimore City. 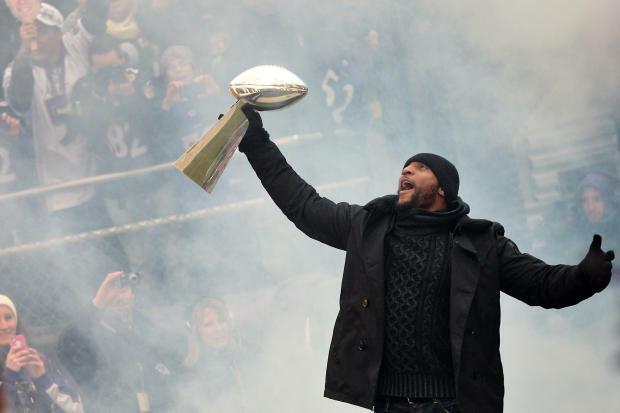 With the announcement of Linebacker, Ray Lewis’ retirement just before the Ravens’ 2nd SuperBowl win, Baltimore was filled with bittersweet emotions amidst the extreme excitement. The parade was scheduled to begin at 10:45 a.m. at City Hall, but it was delayed to about 11:30 a.m. The tremendous volume of people caused high-traffic congestion on the interstates and streets surrounding the stadium. The mayor’s Office of Emergency Management said the delay was needed to ensure the safe assembly of the Ravens team members at M&T Bank Stadium, which is the home of The Ravens.Once the festivities started, the energy at City Hall was unbelievable. Fans roared with delight at the mere sight of the Baltimore Ravens as they candidly greeted the massive crowd. Impromptu speeches from Ray Lewis, QB Joe Flacco, and Safety Ed Reed followed, with Ed Reed also singing his rendition,of the Eddie Money classic, 2 Tickets to Paradise. Due to unexpected numbers, many fans were not permitted to enter the stadium after officials said it reached safe capacity by 10 a.m. Approximately 90,000 people were in the stands and on the field. The fans who were lucky enough to make it into the stadium heard more speeches from Joe Flacco who was also crowned MVP, Coach Harbargh, Ravens owner, Steve Bisciotti, and of course Ray Lewis, who stylishly entered the field with the Vince Lombardi Trophy in hand. While performing his ever-so-famous Squirrel Dance, he was briefly joined by Ravens’ Wide Receiver Jacoby Jones. One of many highlights of the Superbowl was when Mr. Jones did the dance each time that he scored a touch down. 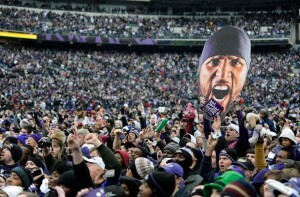 After Ray Lewis took the stage, he affeciationately thanked Baltimore for his last ride. City officials implemented several street closures during the event, and roadways reopened following the procession. Despite this, commuters still dealt with significant delays coming into and leaving the city. Guess you just can’t hide that Purple Pride!